There’s a story about Napoleon that goes something like this: At a state dinner, he gave his soldiers silver utensils and his court gold. But the guest of honor, the king of Siam, was given utensils of—aluminum. Was it a not-so-subtle slight to the king? Not at all. Despite its relative abundance, aluminum was one of the rarest elements on Earth because it was hard to extract. Fast forward a few decades, and a new extraction process using electrolysis had made aluminum abundant and cheap. Today, we use it everywhere. We cover takeout food in foil and toss it away without a thought. 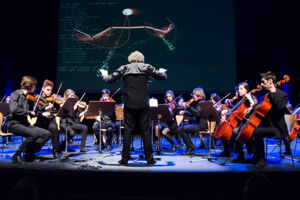 Sinfonietta de San Francisco de Paula performs at Summit Spain. “Exponential Prometheus” plays behind, showing a real-time, Kinect-enabled visualization of the conductor’s motions. We may believe we have a resources problem—not enough water, not enough energy—but technology is a powerful liberator of resources. And if circumstances could change so quickly and radically in Napoleon’s time, they can change even faster today. 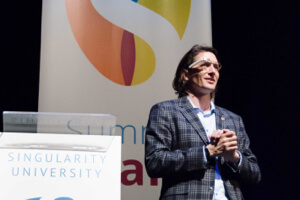 This was the message Rob Nail, CEO of Singularity University (SU), gave to participants, as he kicked off SU’s Summit Spain. It’s not about seeing things nobody’s seen before; it’s about shifting your perspective. It was no mistake Nail’s talk played so heavily on perspective and seeing things through a different lens. Much of it was dedicated to describing a world just next to ours—a world that can be seen only if you tilt your brain at just the right angle. Once you see it, though, there’s no turning back: The power of digitization, information, computing, and an exponential pace of progress yields unexpected outcomes. Nail went over some classic examples. Kodak invented the digital camera, but failed to see how anyone would want one. A few decades later, Kodak was out of business, and Instagram, without producing a physical product, was worth a billion dollars. Airbnb doesn’t own a building. Uber has not a taxi to its name. Yet both are now worth not a billion—but billions. Rob Nail at Summit Spain. We all tend to be a little like Kodak. We write off technology early in its development and then get blindsided when it reaches maturity. Nail wore Google Glass onstage, though he admits he doesn’t use it much. Why? He thinks it too is like Kodak. Sure, Glass is clunky, looks geeky, and doesn’t do much. It isn’t worth $1,500. But is it a fad? Not necessarily. This is the difference between an exponential and linear view. Nail suggested face recognition could be pretty cool for a speaker like him. He might see digital name tags hovering above audience members. He might fire up an app that reads expressions (asleep, engaged, annoyed) to gauge his performance. Another app might read pulse and temperature, correlating them to truthfulness in a negotiation. “Obviously, never play poker with someone wearing Google glass,” he said. The point? Glass is an early prototype. Prototypes are often deceptive and cause us to get overexcited as we extrapolate to the finished product. But when the prototype doesn’t live up to the hype, we dismiss it—just as things get really interesting. The next version of Glass will look different. It will integrate into your glasses completely. Eventually, perhaps into contact lenses. And once it hits it stride, we may wonder how we lived without it—like the first wave of mobile phone adoption or smartphones a little later. Magic Leap is working on advanced augmented reality. What else is literally and figuratively opening a portal beyond our day-to-day world? How about virtual and augmented reality devices? Oculus went from garage to $2 billion acquisition in 18 months. Nail thinks they got lucky. Google Cardboard does much the same thing as Oculus Rift, with a smartphone and cardboard headset. In other words, that’s how fast VR is moving. 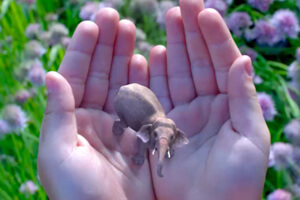 The mysterious Magic Leap made headlines last year by closing a $550 million investment round. How’d they do it? A simple demo. The Magic Leap team set up a table and had investors view it through their tech. There were two coffee cups side-by-side—one real and one digital. They asked prospective investors to pick the real cup. Evidently, the task wasn’t too easy. “And after that they invested, right?” Nail said. One interesting outcome of all this: Augmented and virtual reality may make us bold, Nail noted. We can overcome fears through immersion. By facing up to flying, heights, spiders, or public speaking in the virtual realm, we can slowly ease our anxiety, eventually feeling less in the real world too. And that, Nail told participants, is the point of the next few days too. Immerse yourself in a new world, face up to your anxiety, embrace your excitement, come up with new ideas, and then return to your life ready to be bold, to take action. We don’t have all the answers, he said. Good ideas come from anywhere. Perhaps Summit Spain itself can generate a few. The event has 1,100+ attendees from 30 countries and 250 companies and organizations. Executives, thought leaders, policymakers and entrepreneurs. It’s a powerful group, Nail said, and an exceptional opportunity to conceive and share moonshots. “We work to transform the individual, to transform the organization, and ultimately transform the world,” Nail told the audience. So, let’s get started.